I’ve never been one who likes to be cooking in the kitchen while guests are relaxing in the living room. 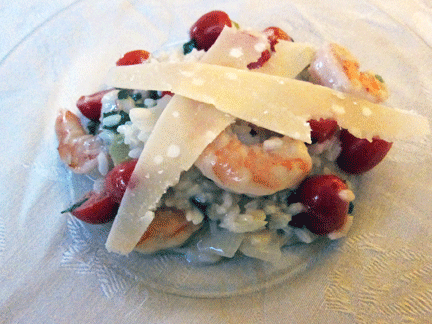 I make this shrimp risotto for “family”, meaning close friends who know where the wine is and when to light the candles. They are welcome to stir in a ladle of stock while the risotto bubbles away. “Extra-large” shrimp means 12-15 shrimp per pound. Don’t worry if you can’t find watercress at the market (I couldn’t today), as flat-leaved parsley works well too. Use a wine you would choose for the table. A Viognier caught my eye, so that’s our wine here. 1. Heat stock to a boil, then reduce to simmer. 2. Heat oil in a large, heavy-bottomed pot. Add the shrimp and cook for two minutes, turning once with tongs. Add the brandy and cook for one more minute. Turn shrimp and sauce into medium-sized bowl and cover. Set aside. 3. Melt butter in same pot. Add onion and celery and cook over medium heat for five minutes. Add the garlic and cook for one more minute. 4. Add rice to the pot and stir to coat with oil and juices, cooking for three minutes. Season with salt and pepper and add wine, cooking until most of the wine has been absorbed. 5. Add first cup of stock and stir while cooking until most of it has been absorbed. Repeat this process two more times. 6. Stir in tomatoes and parsley. Add stock in one-cup measures until used up. Rice should be tender. 7. Add the shrimp and brandy sauce. Taste for seasoning. 8. Garnish each portion with a few shavings of Parmesan and serve. Liz, This looks so delicious that I want it for breakfast… (now) …I love shrimp. Send me the leftovers! It would be a great white wine dinner too.